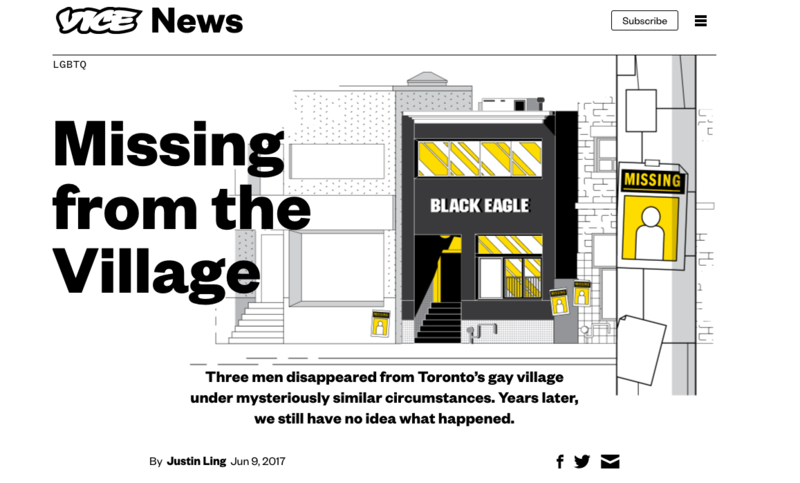 Justin Ling's 2017 feature on the disappearance of three men from Toronto's gay village. Screenshot by J-Source. Reporters who have been tracking multiple disappearances of Toronto men in recent years say much needs to be done to hold authorities to account. Justin Ling was at home the morning of Jan. 18, 2018, fighting an illness. Then a freelance writer, he had no idea that day was about to bring a major break in a story he had been working on for years. Since about 2015, Ling had been investigating the disappearance of several men in Toronto’s LGBTQ community. Skandaraj Navaratnam disappeared in 2010 after leaving the Black Eagle, a bar in the Church Wellesley Village; the same year, Abdulbasir Faizi was last seen at Steamworks, a local bathhouse. In 2012, Majeed Kayhan disappeared — his friends didn’t hear from him for a week, according to Ling’s reporting. Then, two more men — Andrew Kinsman and Selim Esen — disappeared in 2017, within months of each other. In December, someone had asked Ling if he thought the police would ever arrest anyone. “I said, ‘I don’t think this will ever get solved,’” he responded. “I think this is going to be an open question forever.” Police had that year created a task force to investigate the disappearances, the second one since 2012. But that day, Ling watched as the Toronto Police Service announced in a televised press conference they had arrested Bruce McArthur, a 66-year-old self-employed landscaper, and charged him with the first degree murders of Kinsman and Esen. “I was totally floored,” Ling said. Since then, McArthur has been charged with an additional four counts of first degree murder in the deaths of Majeed Kayhan, Soroush Mahmudi, Dean Lisowick and Skandaraj Navaratnam. According to the CBC, police are now looking at “hundreds” of missing persons cases, as well as outstanding murders and sudden deaths, for connections. Reporters and community members have demanded answers about the disappearance of these men, and in the course of their work discovered that there was something much darker happening. But important questions of accountability remain. Xtra was among the news organizations who covered the disappearances — and kept coming back to it. Formerly an LGBTQ-focused alt-weekly, Xtra’s beat was, and remains, covering Toronto’s LGBTQ community, though now it is done totally online. (Disclosure: From 2014 to 2015 I was a reporter for Xtra). 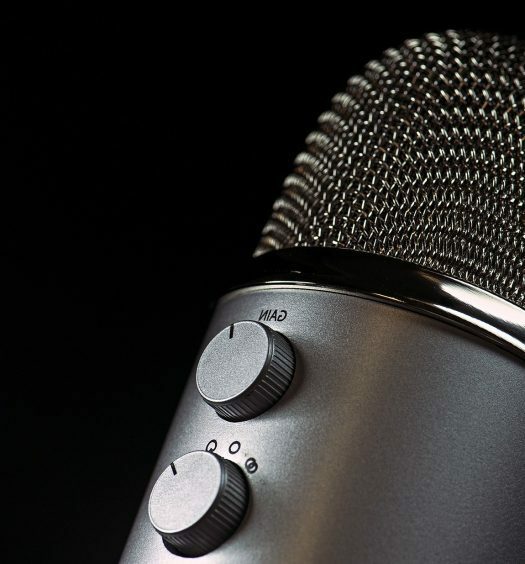 Even in 2012, Andrea Houston, then Xtra’s Toronto reporter, heard whispers among community members that there may be a serial killer preying on men in the Church-Wellesley village. “It has been something that has been floated around,” Houston said. A feature Houston published that year noted the connections between the three known missing men. But at that time, no arrests were made. The case was largely out of the public eye until the disappearances in 2017. Historically, the relationship between Toronto’s LGBTQ community and police has been fraught. In 1981, according to the CBC, “police officers armed with crowbars and sledgehammers raided four city bathhouses and arrested more than 250 gay men,” an event that became known as the Bathhouse Raids. Houston said there’s there is still fear of authoritative systems that exists in the community. “Especially systems that criminalize them,” Houston added. While working at Vice Canada, Ling decided to take a few weeks to work solely on his story. Even his editors asked him if he was sure he wanted to suggest the idea that a serial killer was involved, but Ling pushed for it. “It’s been frustrating because I felt like a crazy person the entire time,” he recalls. Ling pointed out these men had families, jobs, pets and networks of people who they would have checked in with — and they left bank accounts and passports untouched. Yet this theory was floated about many of the men after they vanished. Arshy Mann, a reporter for Xtra, has been covering the case regularly since Kinsman and Esen disappeared. He thinks that had this case concerned the disappearance of five white women from the Annex, an upper class neighbourhood near University of Toronto, it would have been handled quite differently. “I think this would have been something that people would have been asking mayoral candidates about, that police were being pressured about by both the public and the press in a much more constant way,” he said. It was a grim vindication for these reporters to find out that what they and so many other community members suspected was, perhaps, the truth. The case has now captured international attention, with Time and People covering it. Local outlets are dedicating significant resources to covering developments in the story, with near-daily updates on Toronto area newscasts. Ling has since joined the Globe and Mail to report on the case. He, along with Globe and Mail reporter Tu Thanh Ha, broke a story that showed McArthur had both a history of violence, and connections with four of the five missing men. Mann too has uncovered important details — he broke the news that McArthur dated Navaratnam. However, this is a story that can easily be sensationalized, and reinforce harmful stereotypes about the LGBTQ community. Mann said he’s noticed at police press conferences, questions often centre around McArthur’s use of dating apps. “There seems to be an idea that these dating apps are almost dangerous, and I think the underlying presumption (is) that gay men are promiscuous,” Mann said. The truth, according to Mann, is that McArthur met men in many ways — that’s part of the story that needs to be told, rather than resorting to stereotypes. The reporters J-Source spoke to agree that journalists covering the case as it unfolds need to focus on holding authorities to account. Questions include why it took so long for police to make an arrest, and why police were reluctant to acknowledge the theory that a serial killer could be involved. “(We need) to keep focusing on what broke down,” said Houston.